O+ 8.37y Spotted! A Budget Android 5.1 Lollipop Phone? 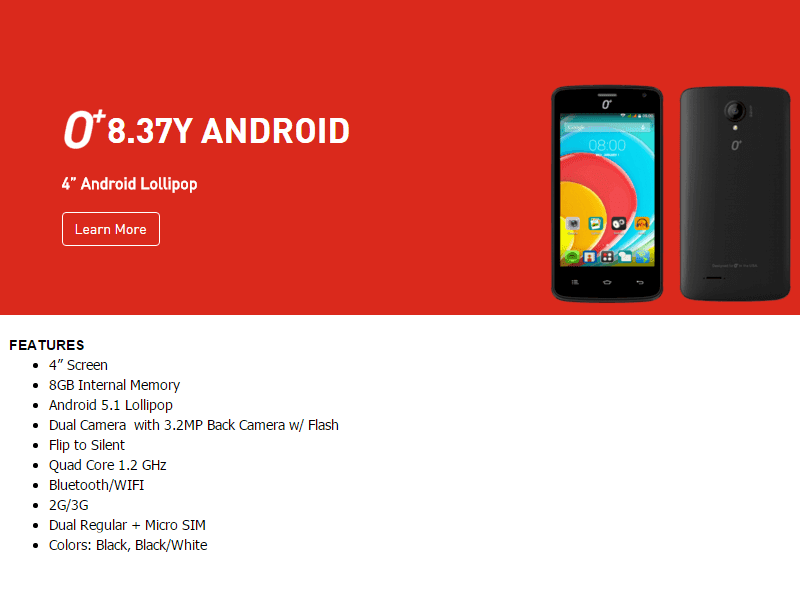 Home / mobile / news / o+ 8.37y / o+ 8.37y lollipop / o+ 8.37y price / o+ 8.37y specs / o+ usa / O+ 8.37y Spotted! A Budget Android 5.1 Lollipop Phone? O+ USA has revamped their 2013 budget handset now called the O+ 8.37y. It now has Android 5.1 Lollipop on board, quad core processor instead of dual core and larger internal storage with an expandable 8 GB. The screen size remains the same at 4 inches together with the 3.2 / VGA cameras on front and back. The RAM, exact type of CPU and GPU is unspecified as of this moment yet together with the price. Let's wait for further announcement. I'm expecting this to be an extra affordable device.